NICE NUMBERS: Raider Bingo's Mark Orchard, Jo Bond and Russell Enders congratulate a lucky winner. 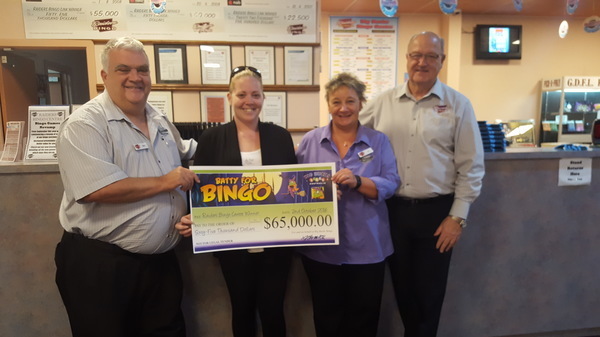 Bingo enthusiasts in Geelong’s northern suburbs now have somewhere to meet lifelong friends and indulge their passion for lucky numbers. Raiders Bingo Centre this week set up a new twice-weekly game at Bell Park Sport & Recreation Club at Hamlyn Heights. “It’s basically establishing a game of bingo in the northern suburbs,” says Raiders Bingo manager Russell Enders. Russell runs Raiders Bingo Centre at Breakwater, which has been going since 1998. “A lot of people enjoy a game of bingo – they want somewhere where they don’t have to travel to this side of town,” he says. Bingo started at Bell Park Sport & Recreation Club on Tuesday and now runs for two hours each Sunday and Tuesday at the venue. Russell has seen players become lifelong friends during bingo at Breakwater. “They come in and have their seats together chat away and then they go home,” he says. Bingo is much more social than other forms of gaming, Russell explains. But players on the southern side of Geelong need not be worried. Raiders Bingo Centre will still run all its usual day and night sessions at Breakwater throughout the week. Both venues have tea and coffee, food, drinks and free parking. And the best part, says Russell, is the money raised goes to non-profit causes, like local sporting clubs and leagues.